I wasn't sure if woogie was going to post an IGT, so I figured I'd get one going. Go Brewers. Your luck with game threads has been terrible. Please fix that. Yeah, September has been rough. If the Crew doesn't make the playoffs, I promise not to post any game threads next year. Let's have the same result. 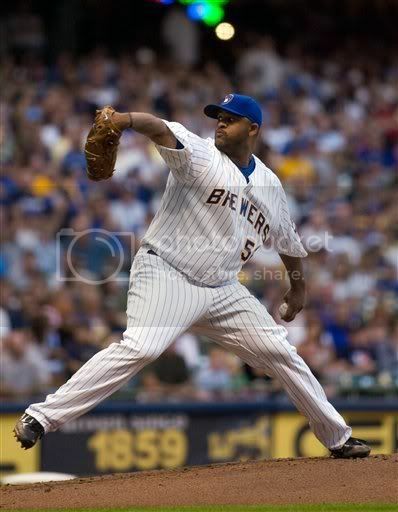 If CC wins this game, I'd throw the bank at him and make him a Brewer the rest of his career. All I ask is no strikes to Soriano. Pinella has said he is throwing is regular lineup against a left hander today. "I'm sick and tired about hearing how about what a great baseball team the cubs have. Screw'm! This is your time! Now go out there and take it!" Last edited by mikevan1818 on September 27, 2008, 11:57 PM, edited 1 time in total. I'll be in the Terrace, wearing my lucky powder blue Molitor jersey (worn for the Fielder and Braun walk-off games this week). Let's go CC! Is this game gonna be on 94.5 WKTI in Milwaukee because of the Packers being on 620 WTMJ? No, they changed it to 620. I assume packers are on 94.5. I had multiple dreams about the game last night but my recollection is that both the Brewers and the Mets win 5-1. So nervous. Boys, we have waited 26 long years for this chance. I was a 25 year old kid last time and I thought it would happen all the time. Now, on my 51st birthday I know this chance is a special gift. Let's go get this one. Who knows, some of us might not ever get this chance again. Have fun and good luck. We know you can do it. Accuscore gives us a 77% chance of winning today, but that probably doesn't consider the lack of rest of Sabathia and our inability to hit AA pitchers. They give Florida a 45% chance of winning. You know what's within your reach. You can get there, today. I'll echo sauveb: have fun, and good luck. Let's just get this thing done once and for all. Please, Brewers. It's cool that for once the Packers get pushed to the secondary station. Man I'm getting nervous thinking about this game already. A blowout win would be super for my state of mind. I can't handle this today. I really can't. I almost want to just wait and see what the scores are of their game and them mets. WOW! BIG GAME!